Types of volcanic eruptions | Strike of Lightning! ROME, March 18. – The volcano Etna on the Italian island of Sicily, erupted today for the fourth episode of its kind recorded in 2012, and drove a column of ash that reached between 6000 and 7 thousand meters above sea level. During the morning the first signs of activity of Etna, the tallest mountain in Italy in the southern mountains of the Alps, with 3 thousand 322 meters high, which recorded an eruption from 8.00 am (06.00 GMT). The eruption took place in a very active crater southeast of the volcano and lava moved down the slope of the Valle del Bove, in a desert area, the wind has made the cloud of ashes to shift to the east. At the moment this new eruption has not brought changes in the activity of the airport of Catania, near the volcano, although it has provided the opportunity to change some routes if necessary, reported Italian media. During 2011, , located in eastern Sicily, which inflates and deflates the pressure of internal magma, erupted 18 times this volcano is 45 kilometers in diameter. Italy, March 4. – The Sicilian volcano Mount Etna erupted on Sunday for the third time so far this year. The volcano had lava emission and Strombolian activity, volcanism characterized by explosive eruptions separated by quiet periods of varying duration. The lava emissions were accompanied by the escape of volcanic ash, Italian media reported.On February 9, in its previous eruptive activity, a new crater was borne on the volcano. 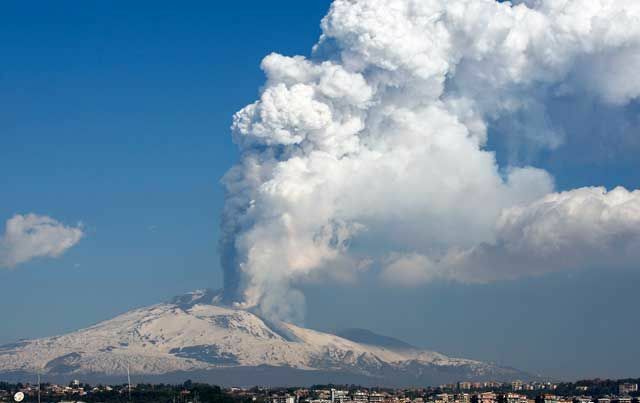 Etna had erupted on the 27th of January, after more than 50 days of rest. Etna is the largest volcano in Europe and one of the most active volcanoes in the world.